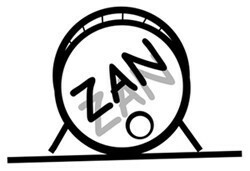 Zan was a jazz trio that I played in while living in Calgary. It was the brainchild of drummer Krista Malden and named after her daughter Zannika. We played a handful of Krista's originals and I have to say, they were definately original. Being a drummer, her tunes were full of interesting rhythmic material, odd-time-signatures, and an unbiased approach to melodic development. We only played live once but it was a fun gig that was received well.